﻿ Local sights and attractions. Guest House Na Lednicke. Accommodation in apartments. Hlohovec, Moravia, Czech Republic. 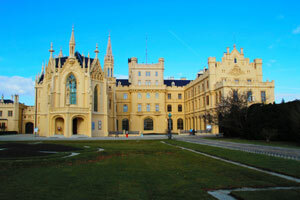 Lednice Castle www.zamek-lednice.com - neogothic castle built by Liechtenstein princes as a summer residence. The castle is surrounded by a regular French style park and an English landscape park featuring a circular walking route. The minaret viewing point can be achieved on foot, in a horse-drawn carriage or by motor boat. Lednice is situated only 3 km away from the guest house and is easily accessible by car, bus or bike. Valtice Castle www.zamek-valtice.cz - luxurious baroque winter residence of the Liechtenstein family. Outside thecastle there is a kitchen garden where adults can take a rest and children can play gardeners bylinkovazahradavaltice.cz. 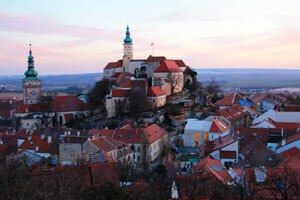 A castle visit should best be combined with Moravian wine tasting. The castle cellar houses the Czech Republic wine salon. We can recommend “all-inclusive” 90-minute tasing www.salonvin.cz. Besides the larger castles the green zone of Lednice-Valtice region features a number of smaller architectural gems that are best achieved by bicycle. Just outside Hlohovec you can see the colonnade of Three Graces, on the way to Valtice you come across St. Hubert Chapel, not far from Lednice Castle you can visit the artificial ruins of Yanuv Grad. From the heights of the historical city centre you can admire beautiful views of the castle, the Palava hills and the vineyards www.mikulov.cz. You can visit the castle of Mikulov and see the wine-making exhibition and the cellar featuring a huge 10000 litre wine barrel. If you like, you can climb a sacred hill to St. Sebastian Chapel and see an excellent view of the surrounding countryside. You will definitely enjoy a wonderful Moravian night in Pan Solarzhik’s rock wine cellar www.podkozimhradkem.cz. We will be glad to arrange a transfer to the wine cellar and back. Three Emperors’ Battle Memorial in Slavkov-Austerlitz. Start your journey by Slavkov Castle www.zamek-slavkov.cz. Then visit the multi-media exhibition at the memorial of the World Grave on the Prazen Heights devoted to the battle mohylamiru.muzeumbrnenska.cz. 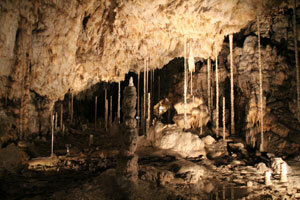 fascinating Punkva caves in the area of Moravian Karst, where you can take a boat on the underground river. A visit should be pre-arranged. Passionte shoppers will enjoy visiting Parndorf outlet www.mcarthurglen.com. On the way you can stop in Bratislava, the capital of Slovakia. You can taste excellent beer at the stylish city brewery in Bratislava www.mestianskypivovar.sk. The beautiful city of Wien with ist historical sights, restaurants and shops is just one hour’s drive from the guest house www.wien.gv.at. 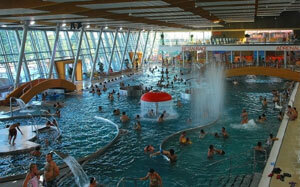 You can relax all the year round at the thermal centre of Therme-Laa 40 km away from the guest housewww.therme-laa.at. 30 km away you can visit a new modern water park of Aqualand Moravia featuring numerous slides and water entertanmet types for adults and children alike www.aqualand-moravia.cz. You can enjoy an active evening playing bowling at Cafe Chaplin www.hranicnizamecek.com. 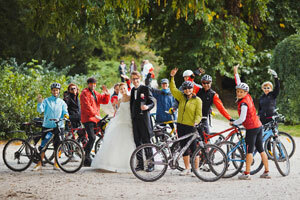 Bikes can be rented in Hlohovec.